This romantic shirt dates from the 1820s, when such poets as Byron, Shelley, and Keats wore their collars open in defiance of conventional fashion. 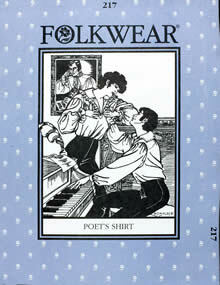 The easy-sew garment is equally poetic for men or women and can be made with plain or ruffled collar and cuffs. 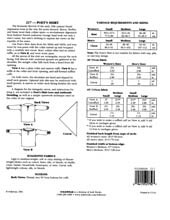 Pattern includes historical lore and instructions for authentic detailing, as well as making and tying the traditional cravat. This is a favorite for men's Medieval/Renaissance costume and contemporary wedding shirt. Misses 6-16; Men's 34-44.